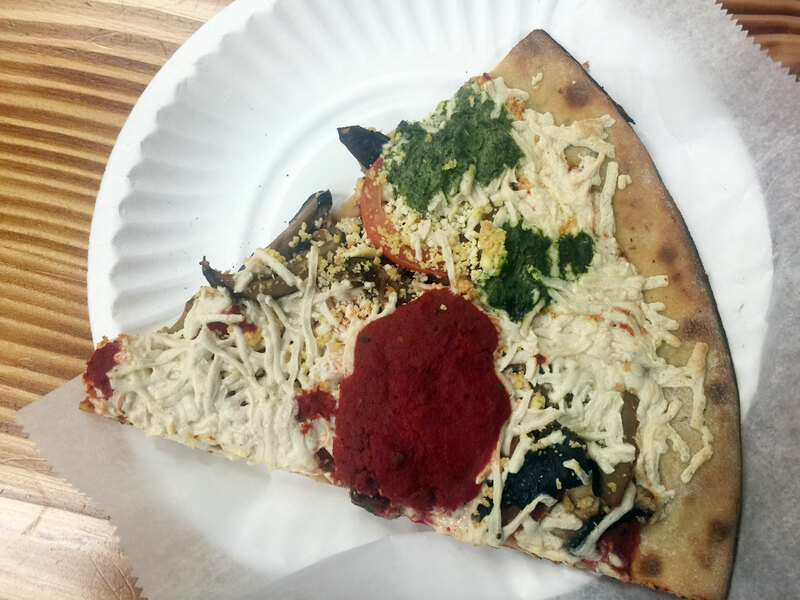 In my last post, I shared my vegan favorite places for dining out in NYC. 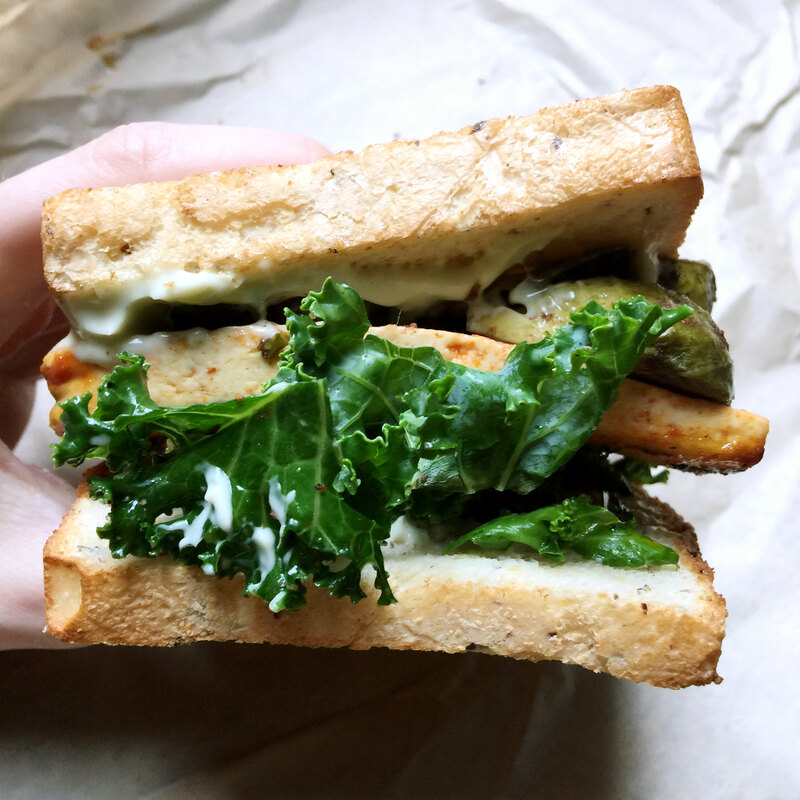 Below are my favorite vegan joints for grabbing a casual lunch (or dinner) in the city. Nestled in Pennsy, the hip new food court of Penn Station, Cinnamon Snail offers flavorful sandwiches and baked goods. My favorite item is their Miso Teriyaki Grilled Tofu Sandwich (with brussel sprouts, black sesame gomasio, and arugula) on toasted gluten free bread. But sometimes I will get the Maple Mustard Tempeh sandwich, which is also the bomb. Cinnamon Snail’s sandwiches go perfectly with their donuts as a light dessert! I always order their gluten-free Cinnamon Maca donut. 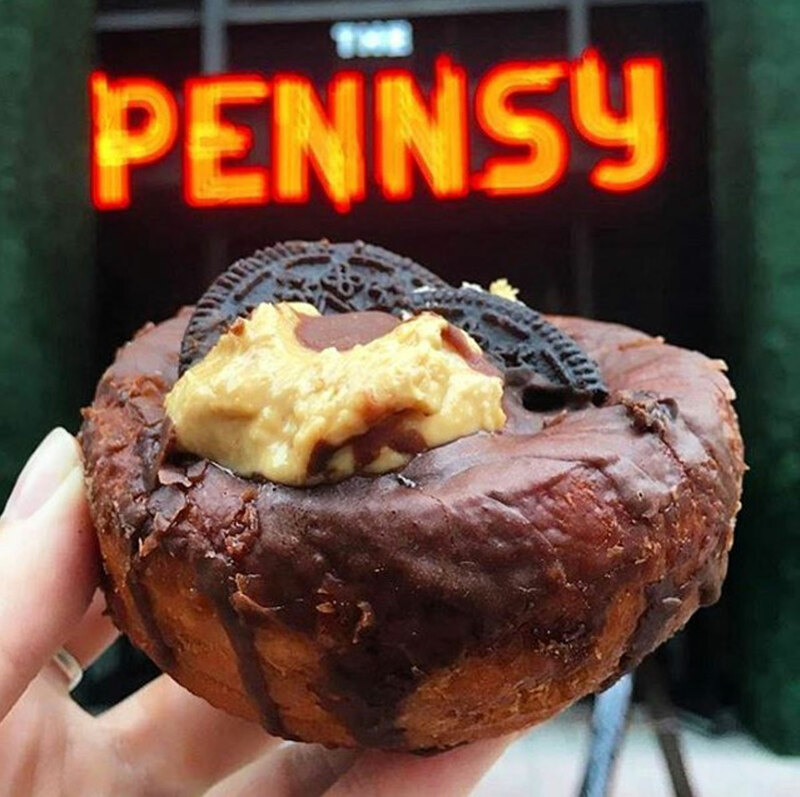 If you’re not planning on eating your sandwich on a train, Pennsy has plenty of room to sit, a nice outdoor space where you can hang out when it’s warm outside, and a bar area where you can buy craft beer and cocktails. 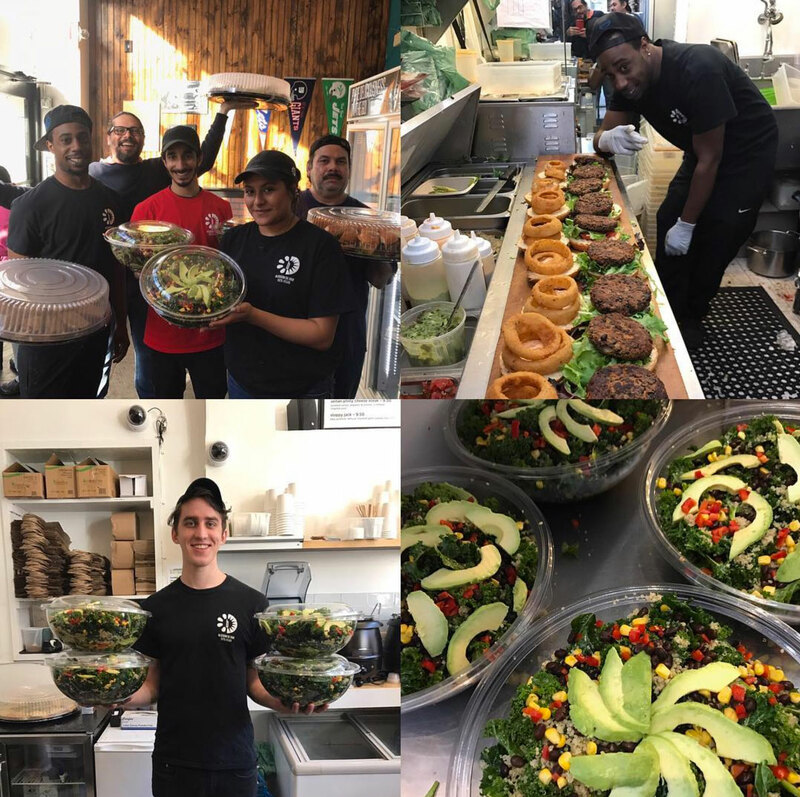 Terri is a vegan fast food chain selling delicious sandwiches, wraps, salads, juices, and smoothies. Owners Craig Cochran and Michael Pease named their company Terri because, coincidentally, both of their mothers are named Terri. One of their bestselling items and my personal favorite is the Breakfast Scramble Wrap (scrambled tofu, vegan sausage, spinach, vegan cheddar, and hot sauce). Because I’m mostly gf, I ask for a gluten-free wrap and sub the vegan sausage with mushrooms. 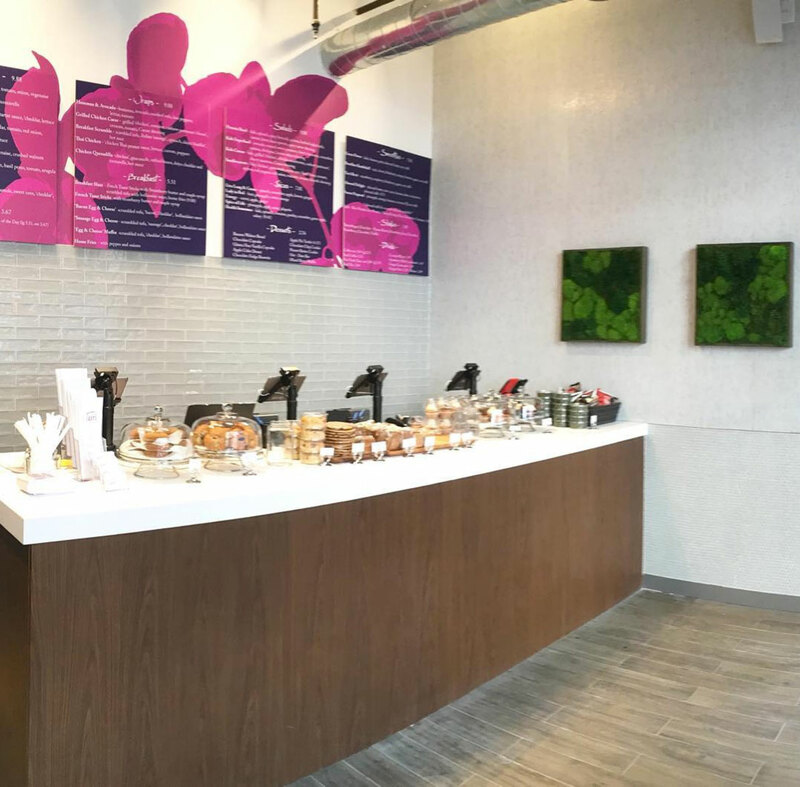 The fast food arm of the Bossom chain of vegan restaurants, Blossom du Jour sells appetizing sandwiches, wraps, and finger food. 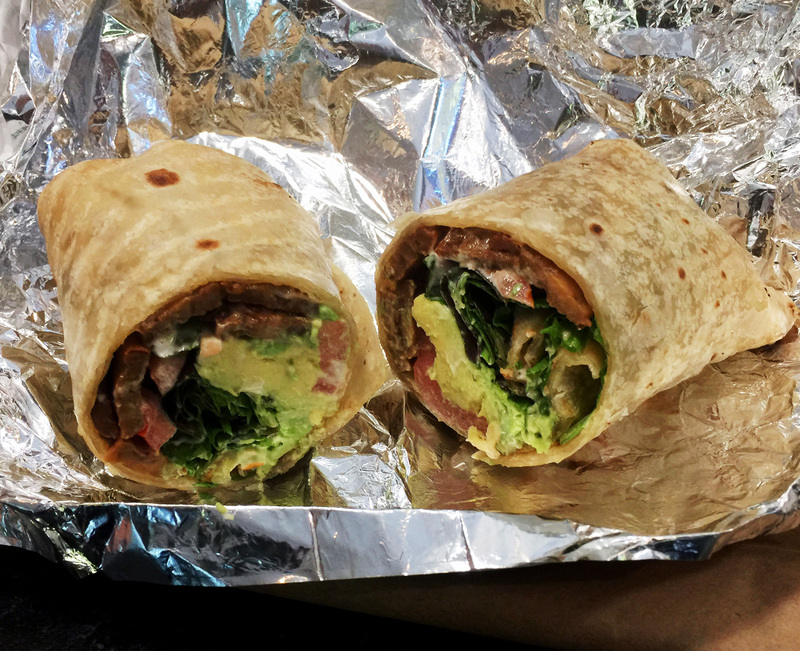 I typically go for the Smoky Avocado Wrap (avocado, smoked tempeh, tomato, lettuce, and chipotle aioli) on a gf wrap. If I’m craving comfort food, I’ll order their Onion Rings or Buffalo Cauliflower bites. 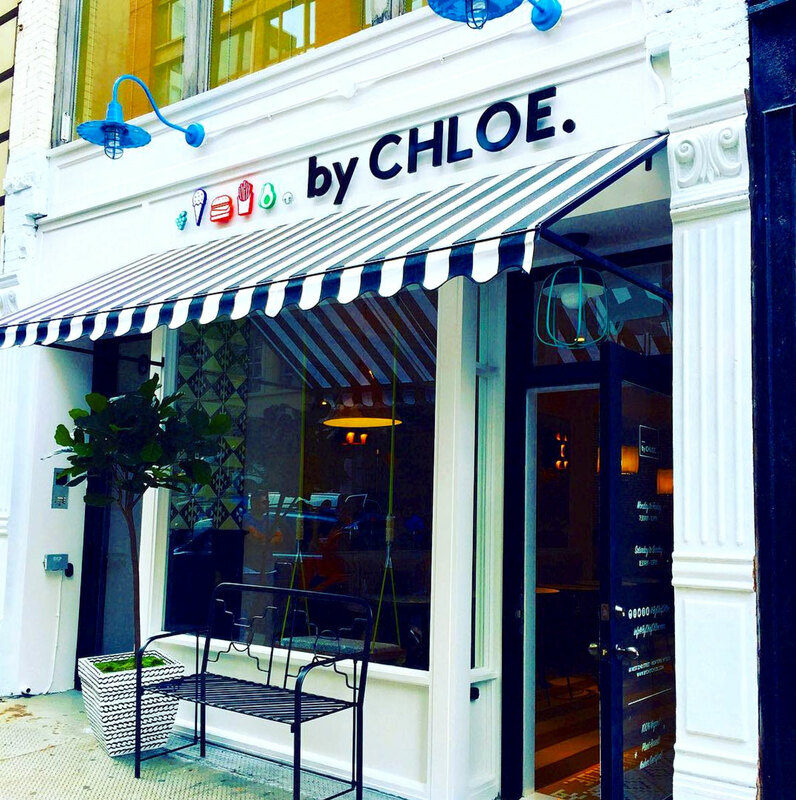 When its original location in the West Village opened in late 2015, the vegan fast food chain by Chloe started off with a bang, attracting large swarms of people that would wrap around the block. 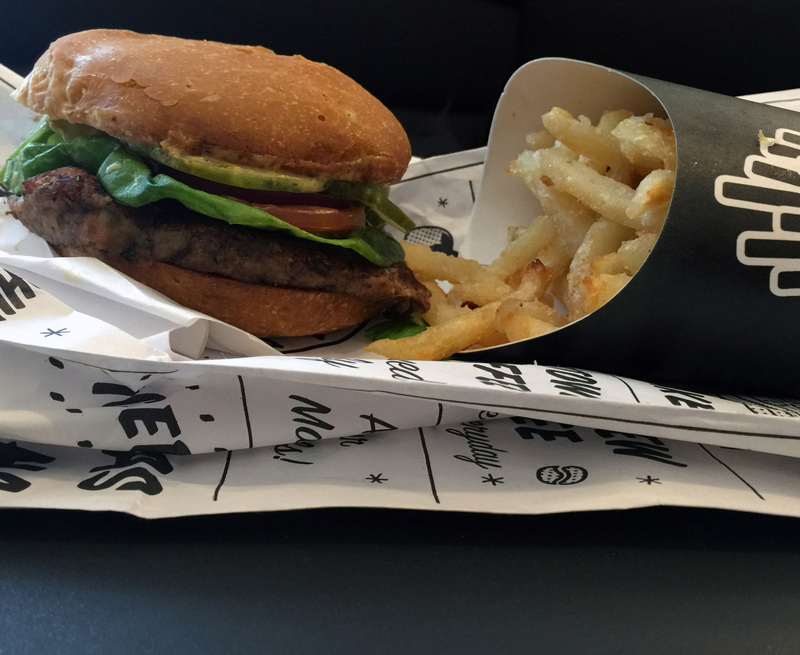 The chain now has locations in various areas of NYC, as well as L.A. and Boston. 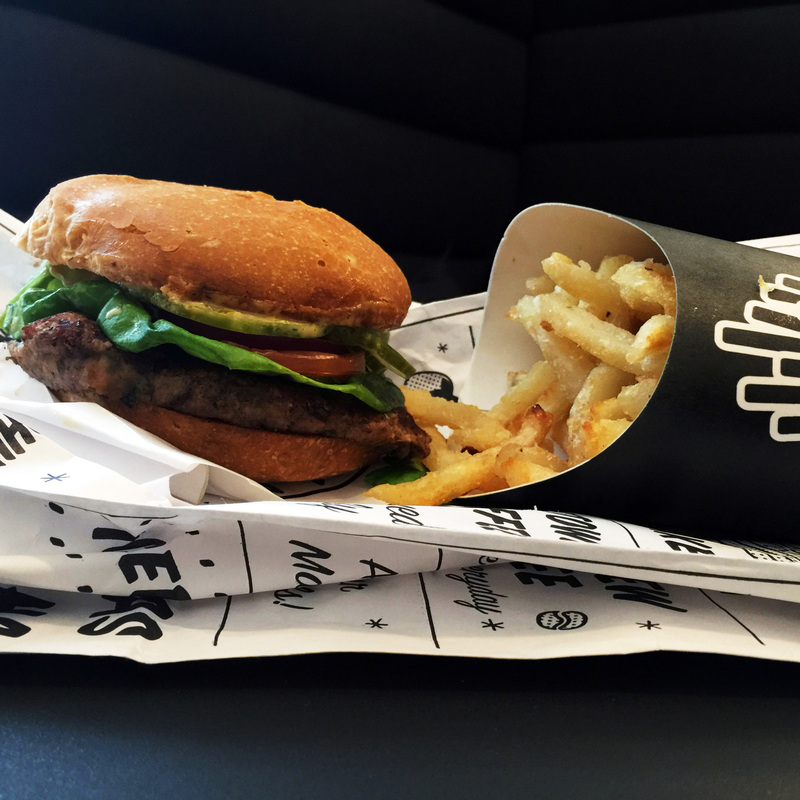 Everything on the menu is brilliant – but my favorites are the Classic Burger (tempeh-lentil-chia-walnut patty with pickles, onion, beet ketchup, and special sauce on a potato bun), the Air Baked French Fries, and the Mac n’ Cheese (made with cashews and sweet potatoes and topped with shitake bacon). 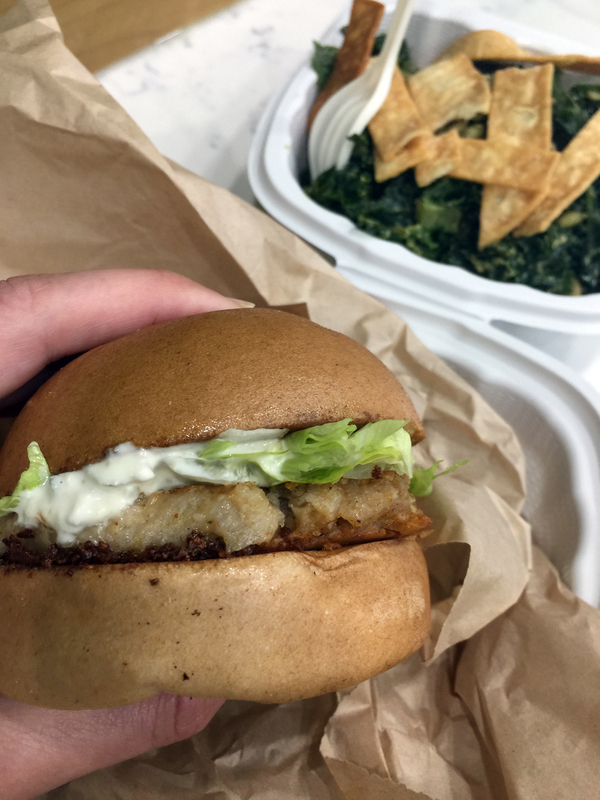 This edgy little vegetarian burger joint in The East Village serves up delicious variations of veggie burgers, all of which are vegetarian and can be made vegan. 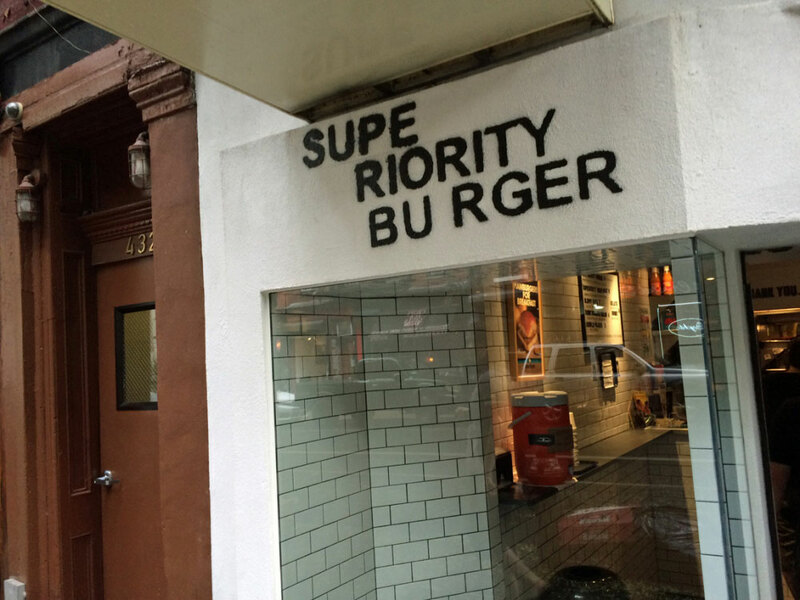 I’ve been getting the classic Superiority Burger, which in terms of taste reminds me of the Big Macs I used to eat on road trips growing up. If you’re hungry, I would advise ordering two burgers as they are fairly small (about half the size of a normal burger). The sides are also great – I normally go for the Burnt Broccoli Salad. 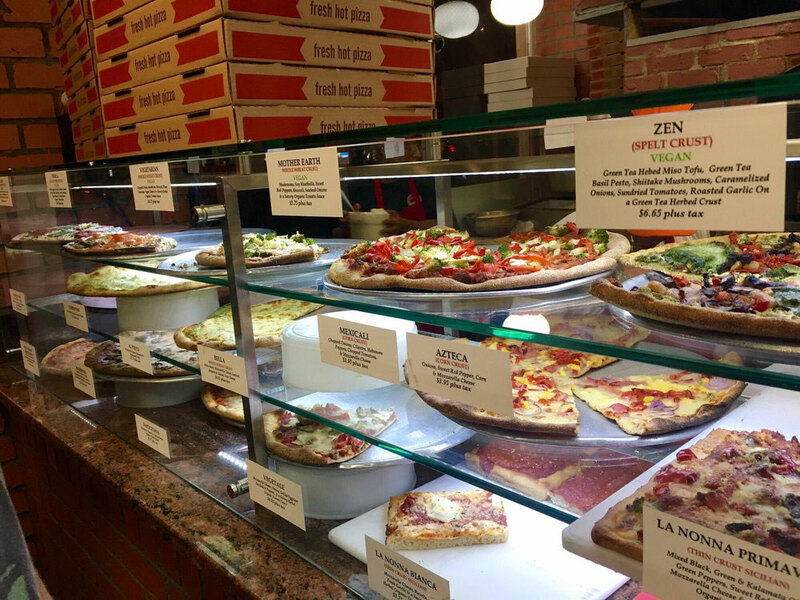 Cafe Viva is a vegetarian pizzeria with lots of vegan pizza options, as well as pies with spelt and gluten-free crusts. The company used to have another restaurant in the East Village that I loved, but it closed a few years back. Luckily, their Harlem location is still going strong. 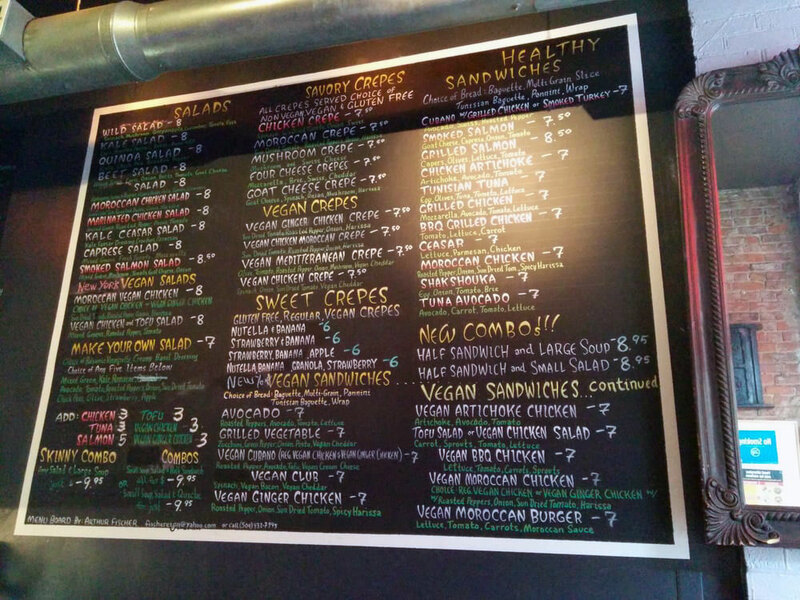 Marty’s V Burger is an awesome vegan pizza joint with a variety of burgers and delicious sides of kale salad. 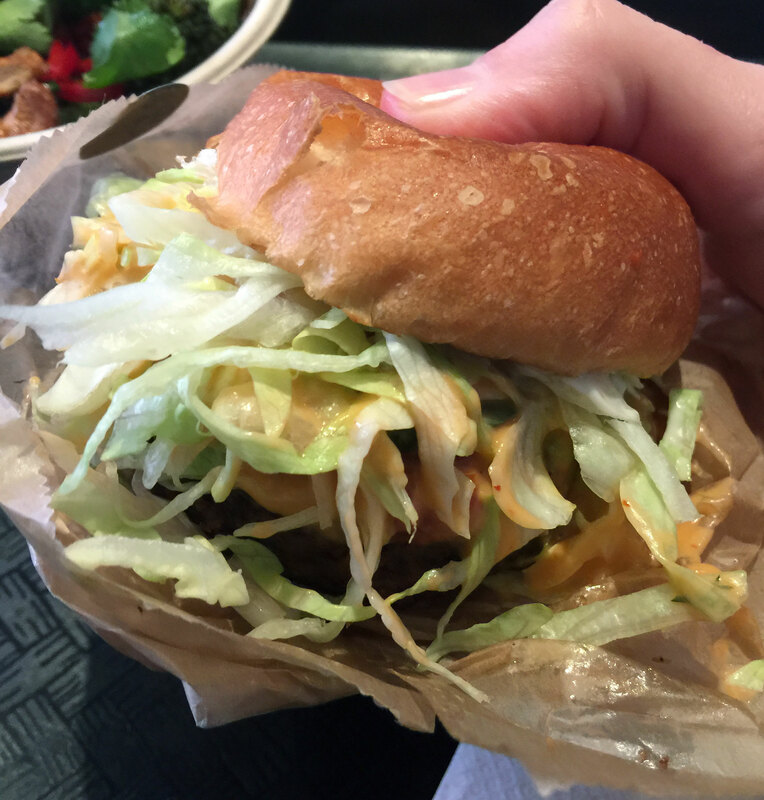 I love the Double Crab Patty, which can be made gf and tastes just like crab cakes, but better! I also love their Drumstix, “a gluten-free soy sensation” – these come with a choice of three tasty sauces. While visiting, there’s a good chance you may run into the owner, Marty, who’s friendly and welcoming. 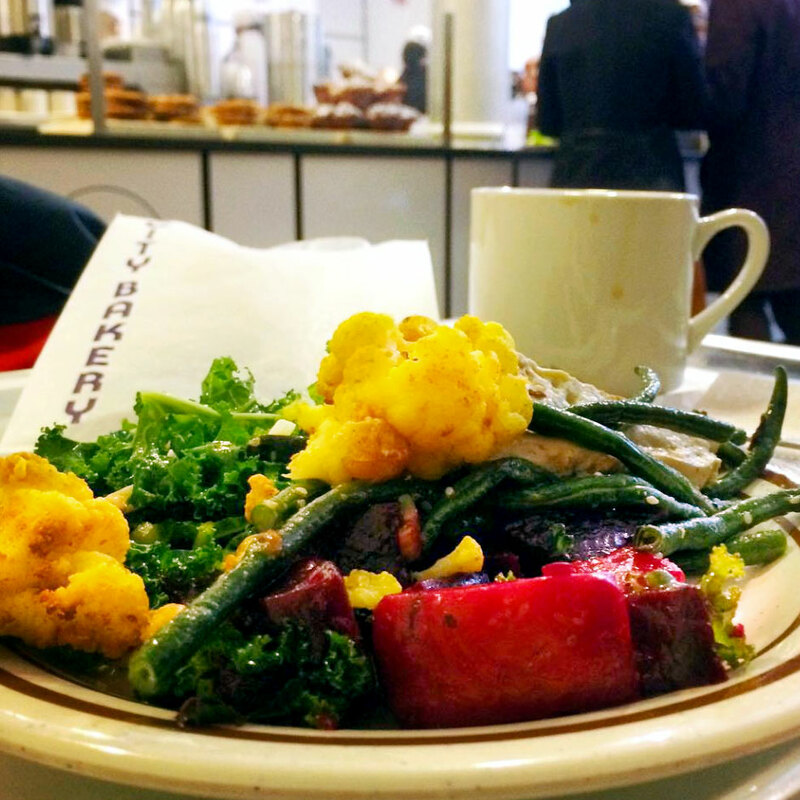 One of NYC’s greatest hidden gems, Jivamuktea Cafe is the food extension of Jivamukti Yoga, a yoga studio right by Union Square. Located in a cozy annex of the studio, the vegan cafe has lots of space to sit and relax for hours if you’re so inclined, and it’s the perfect spot to read or get work done. 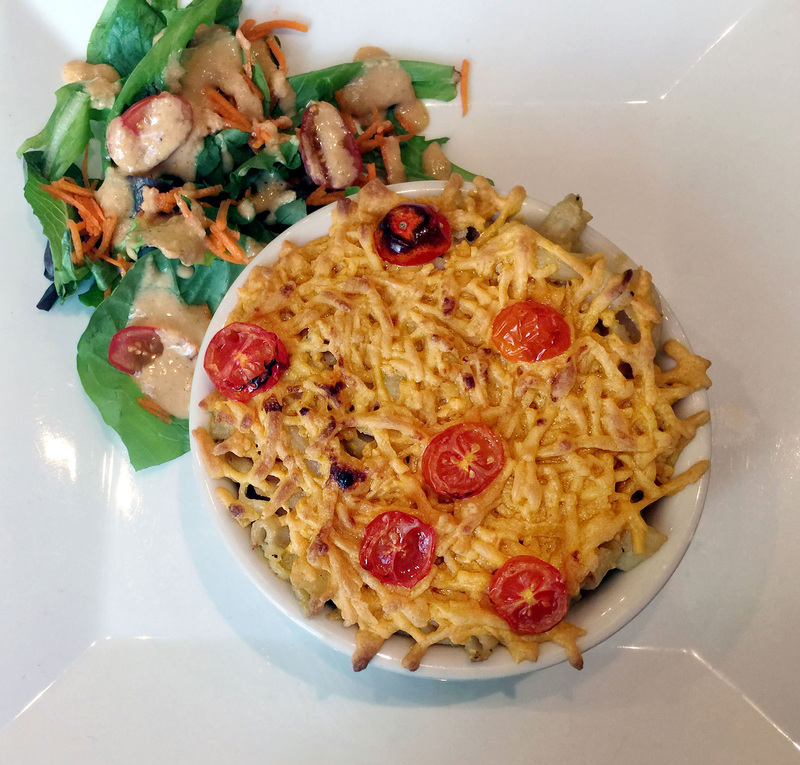 I usually order their Mac n’ Cheese or BLT, both of which can be made gluten-free. Jivamukti owners Sharon Gannon and David Life are committed vegans and animal activists. 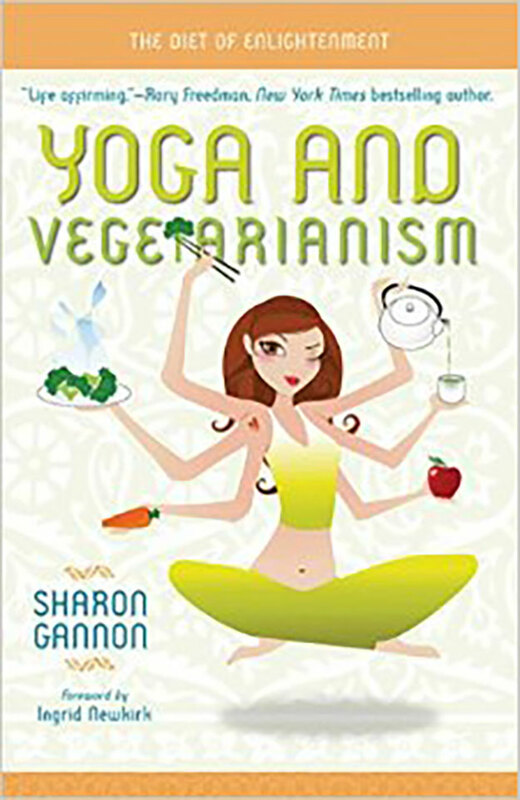 Gannon is the author of Yoga and Vegetarianism, an insightful book which examines various tenets of yogic principles and Buddhist Philosophy as they relate to veganism. As a yogi, I love this book and it has informed a lot of my own personal beliefs around ahimsa, the virtue of nonviolence. 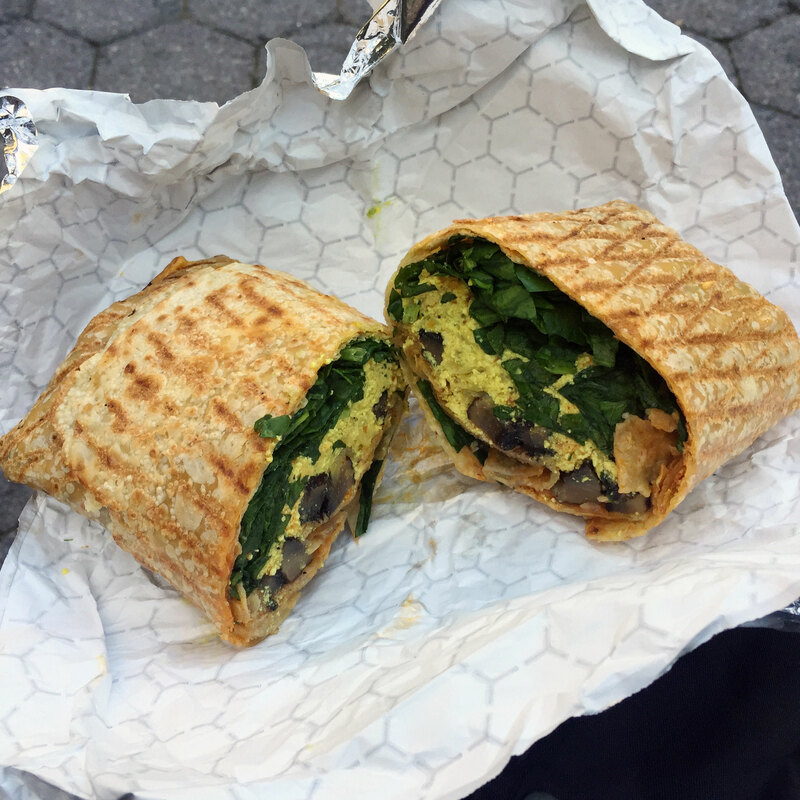 Atlas Cafe is a Moroccan hole-in-the-wall in the East Village with lots of vegetarian options. 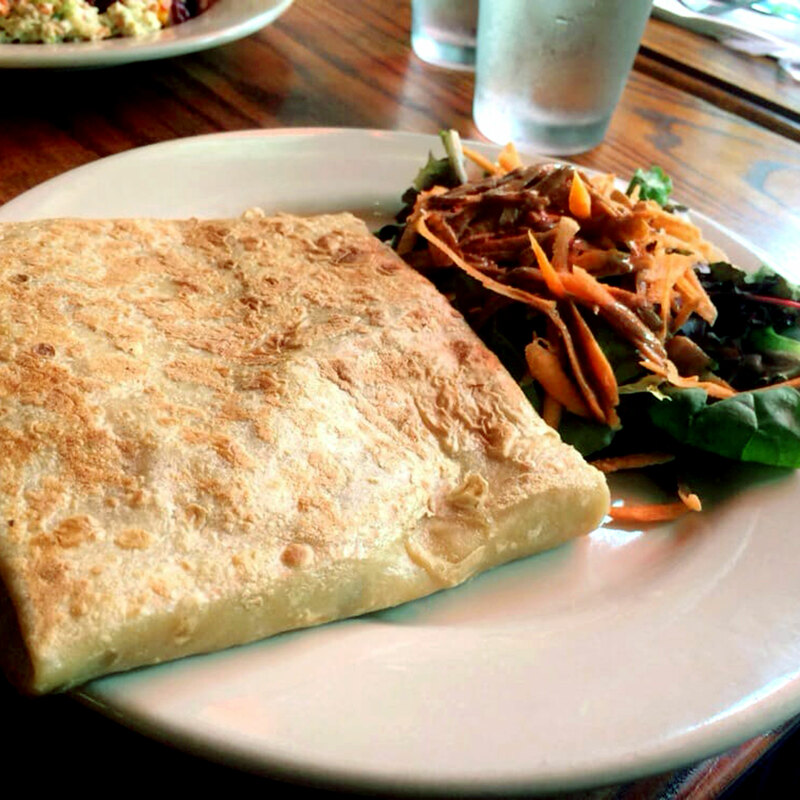 Many of their dishes can be made vegan and gluten-free, including their savory crepes. I like to get the Mediterranean Crepe (veganized) which comes with vegan cheese, peppers, onions, and mushrooms. 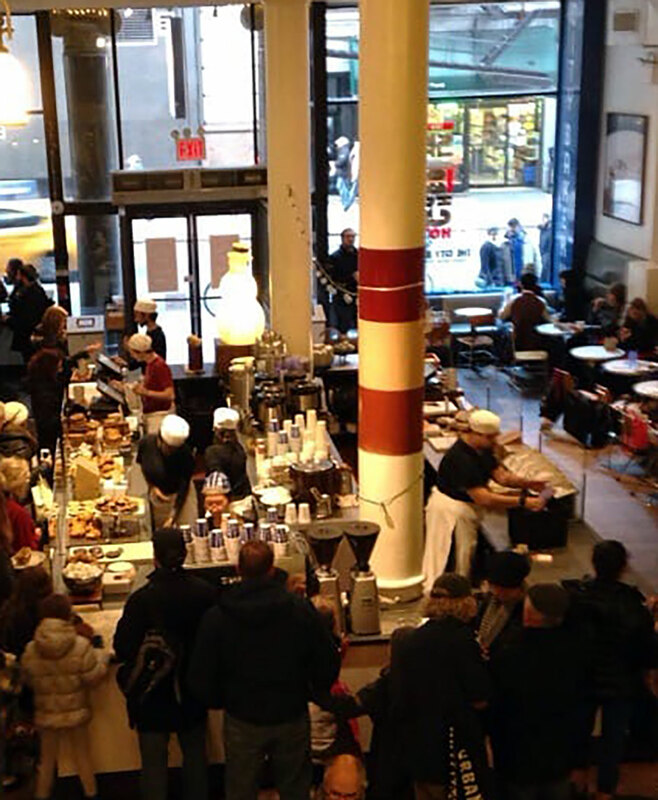 An expansive eatery right by the Flatiron building, The City Bakery is the perfect place to come for lunch with friends or coworkers. They have a wonderful buffet featuring a variety of sautéed vegetables sourced from the Union Square farmers’ market. They also have a flavorful pea-crusted tofu with wasabi sauce that always hits the spot. Be sure to try their “sangria” and vegan cookies. Next up in this series: Brooklyn. 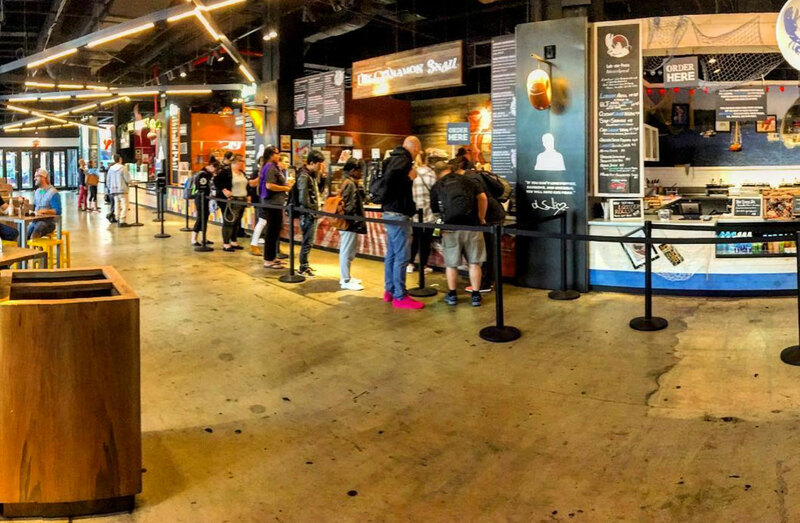 I consider Brooklyn to be an entire city unto itself – and an extremely veg-friendly city at that (perhaps even more so than Manhattan) – which is why it’s getting its own post. Stay tuned!